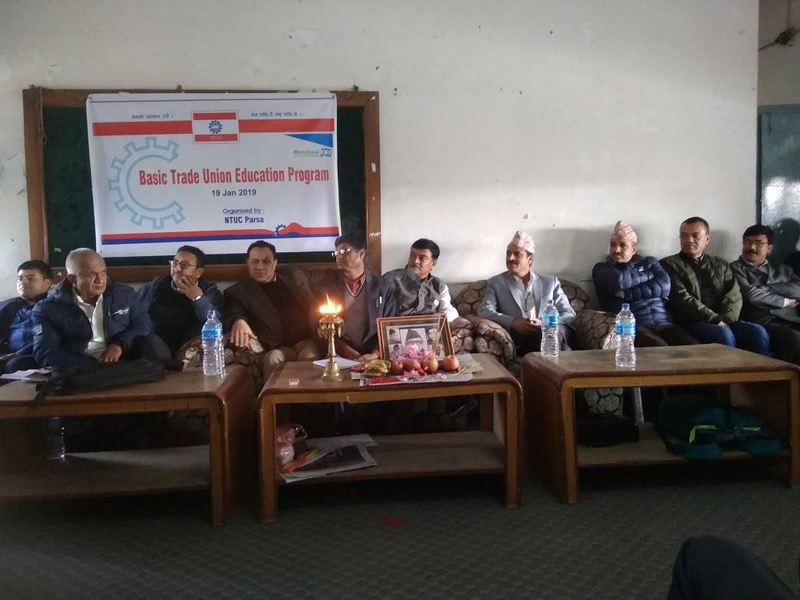 Nepal Trade Union Congress Parsa Committee successfully held 1 day Basic Trade Union Education Program at Birjung, Parsa. A brief advocacy program which targeted Local Government Workers Union was chaired by president of NTUC Parsa Brother Chotelal Shah. The chief guest of the program was Chairman of Nepali Congress Congress Bro. Ajay Kumar Duwedi. Likewise, Special Guest during the program was NTUC Vice-President Bro. Lalit Shrestha, General Secretary Bro. Yogendra Kumar Kunwar, Central Member Bro. Madhav Upadhyay, President of Province-2 Bro. Laxman Prasad Kurmi, President of Nepal Factory Workers Union Bro. Amrit Lal Joshi, Local Government Workers Union Chairman Bro. Nar Bahadur Saud, General Secretary Bro. Ram Prasad Poudel. Accordingly, The guests were president of NTUC Chitwan Bro. Harihar Sapkota, Sanchita Nand Singh, Chandra Narayan Singh Rijal and other NTUC leaders as well. The program formed 11 members Local Government Workers Union Birjung Metropolitan City Committee which agreed Sunil Karn as a president. The NTUC leaders, LGWU and several workers congratulate the newly established committee and urge them to work for the benefits of the workers and democratic norms of the federation. The program started at 11:00 am and concluded to 5:00 pm. During the whole session, exciting number of people was present.